Foresight is simply the act of looking to and thinking about the future. This activity can be amateur or professional, trained or untrained. As we’ll see, foresight is a critical activity we all need to get better at, in order to make a better world. Do you care about the future? Do you want to get better at predicting, creating, and leading the future for yourself, your family, your teams, your organizations, your society, and your planet? If so, congratulations. You are an explorer, and you’ve found a good map that can give you a good start in your quest. Thinking, discussing and acting better about the future is one of the most exciting and valuable things we can do, as self-aware human beings. This Guide will give you a big picture overview of the modern challenges, opportunities, communities, careers, models, skills, methods, leaders, and resources of professional foresight. It will strive to show you why foresight is more important and helpful today than ever before, and to motivate you develop and use foresight to build a far better world for yourself and others. The Guide will also introduce you to the tiny but growing community of professional futurists, people who think and talk about various aspects of the future full-time, for paying clients. A few readers may be called to become professional futurists, and we’ll cover the benefits and drawbacks of that interesting career, which has my career choice for the last fifteen years. A much larger number of readers work in organizations that would benefit from occasional interactions with futurists, as speakers, consultants, board members, or employees, to improve their organization’s thinking and action, in our increasingly complex and fast-paced world. Universal foresight, which includes science, complexity studies, and our models for universal change. Good foresight practice starts with getting better at predicting, creating, and leading your own future. Once you’ve built a basic competency at that, you’ll have earned the right to help others, your family members, teams, and organizations, better prepare for their own future. If you don’t think and act well with your own future, you will build your career on a foundation of sand, and it won’t go very high before your building starts to crumble. The fourth foresight domain, universal foresight is often overlooked by those thinking about the future in lay terms. Far too many people think they can just imagine what the world will be, and create whatever they want. That philosophy works if you are an artist, but if you’re trying to create lasting foresight, you need to understand how the world actually works, and our best models for that today are science and systems theory, our models and philosophy of complex systems. Unfortunately, many leaders today don’t have a strong understanding of science and complex systems. Gaining a Big Picture, universal perspective on change has become particularly important in recent decades, as complexity and change continue to accelerate. Chapters 7 and 11 introduce two universal change models, exponential foresight and evo devo foresight, that I find particularly helpful to understand the Big Picture context and longer-term future of human society. Being a foresight practitioner today requires a little courage and some dancing in the dark. Our field is still emerging and poorly grounded, and foresight itself is not one single profession. Across all of its domains it is instead an expanding and not always well-defined set of professions, ways of thinking, and practices that help communities, organizations and individuals to better anticipate, create and manage change. Yet our field also has a very bright future ahead, as we will see. Foresight practices can be as varied as the individuals who choose them—each unique and personal blends of both science and art. A foresight professional may look like a Futurist, giving keynotes to audiences; an Advisor, Coach or Consultant, offering advice;, a Forecaster, finding trends and predicting; an Intelligence professional, doing sensemaking and pattern recognition; an Analyst, Strategist, Planner, or Manager, supporting decisionmaking, planning, policy, and action in an organization; a Designer or Engineer, creating products or services; an Innovation Manager, improving an organization’s ideation and R&D processes; an Entrepreneur, starting a new business; or an Investor or Venture Capitalist, seeking the next great business opportunities; and an Opinion Leader or Activist, driving conversations and social change, to name some of the better-known choices on offer. With this surprising breadth in mind, some basic questions must be raised at the beginning of this Guide. Why is it valuable to think about the future? Who defines the foresight field, and what is professional? How does one get trained? What are the important types, models, and methods of foresight thinking and practice? What major changes, opportunities and problems lie ahead for our societies, and how can foresight practice help us to better manage them? This chapter will offer some initial answers to these questions. Our answers won’t be definitive, but hopefully you will find them useful, and they will definitely spur new questions for you as well—hopefully better questions than you have asked to date about these important topics. 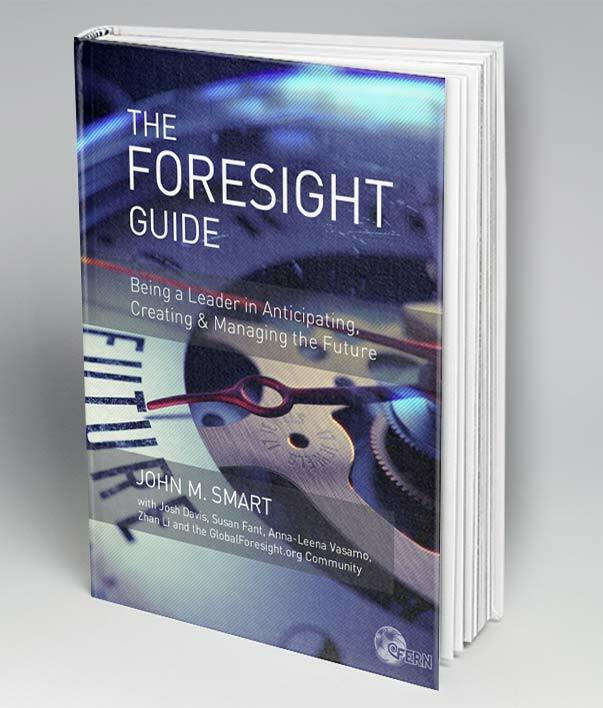 The Guide is intended for three audiences: First, students of foresight training programs and courses around the world, to help them as they move into their careers. Second, professionals in any industry who want to know what modern foresight is and how to better use it in their organizations. Third, anyone who wants to get more earnest or serious about their relationship with the future. You may have been flirting with future for years, but eventually there’s a time to settle down, engage with it, and finally, commit to a serious lifelong relationship. Today is a very exciting time for foresight work—never has human society been more complex and fast-paced, and never have we had as many tools and opportunities available to greatly improve our lives, our teams, our organizations, and our world. We have many problems and threats to manage as well, of course. Moreover, as our technical abilities have grown, the age-old threats and hardships of our natural environment have receded in severity, while new problems, ones we have created for ourselves, have taken center stage. We’ve been a fantastically successful species. Some say too successful, as measured by our total numbers and by our intended and unintentional impacts on the world. For example, we now live in a geological epoch of our own making, called the Anthropocene, an era of human-made climate change. The Anthropocene began roughly 8,000 years ago. At that time only 10 million of us lived on Earth, yet we apparently managed to burn one-fifth of Earth’s ice-free land in that era for forest clearing and hunting. As we’ll see, today’s humans are vastly less violent and unforesighted than in generations past. While the trend is not always obvious on the scale of our own lives, when we look at humanity over the long term, it is very clear that we are co-creating an ever better world. Today we alter our biosphere in far more ways than we did in the prehistoric era, but with far less climate impact per individual, and far more and faster-increasing regulation and tracking of our biospheric behaviors. That’s not to say all our biospheric trends are going in the right direction. Many still aren’t, and we often take two steps backward for every four steps forward in our personal and collective searches for better futures. Today we 7.6 billion human beings and our tens of billions of domesticated animals make up 97% of the carbon mass of all terrestrial mammals. In a vast unplanned experiment, we’ve turned our continents into carbon monocultures, based entirely on us. WWF’s Living Planet Report (2014) estimates that we’ve reduced vertebrate wildlife populations (mammals, birds, reptiles, amphibians, and fish) roughly fifty percent in just the last 40 years (1970-2010). Freshwater populations are down even farther in this period (80% loss), as we’ve grabbed up, polluted, and introduced more successful “invasive species” into all the easy-access freshwater. We’re also still ignorant of the total biospheric diversity we are destroying. We don’t even yet know how many species we’re killing annually, but it is likely dozens a day, and is perhaps 1,000 fold higher than the background rate that would go extinct without our presence. While we probably know all the kingdoms, nearly all phyla, classes and orders, and most families and genuses (taxonomic classes) on our precious planet, our only habitable home in the solar system at present, we’ve mapped just 14% of the species on land and 9% of those in the oceans, if the estimate of 8.7 million species (excluding prokaryotes) on Earth is accurate. Our biological ignorance is incredible. See Vaclav Smil, Harvesting the Biosphere (PDF), Pop. & Dev. Review (2011), and the Smithsonian’s Mass Extinction (2014) for good overviews of these deeply troubling issues. Meanwhile, our global carbon emissions continue grow, toward increasingly planet-altering levels. They helpfully plateaued to just 0.4% growth in 2013-2016, then returned to an alarming 2% growth in 2017. We haven’t yet reached Peak CO2, and growth-oriented plutocrats continue to spread doubt over whether that is even necessary, though it’s clear to all evidence-based thinkers that we must. Though there are plenty of doomsayers who make a business of telling us otherwise, including a number of famous ones we’ll meet and critique in this Guide, both our collective intelligence and our collective foresight are far better today than they were when we first arrived on the scene. They are also accelerating, as we will see. Again, our greatest limitations and problems today are the problems that our tremendous successes have created for us in recent millennia. Better foresight can guide us to solutions to those problems, finding ways out of the traps we create when we are being selfish and greedy and short-sighted. We’ll explore many examples of better and worse paths forward in this Guide.